Reading fiction that has been translated from the language in which it was originally written presents special challenges. Unfamiliar names and unusual place spellings abound, making it difficult to keep the characters and locations straight. Brand names, names of government agencies, political parties, acronyms, slang terms, and even swear words with which the reader is unfamiliar can add up to a cumulative noise that has the potential to overwhelm the story. But exactly these elements make reading good translated fiction so rewarding. The authentic details that only a native could know immerse the reader in a world to which they’ll likely never go; one that, even if they should be fortunate enough to visit, they will never experience with such intimacy or authority. South African crime fiction writer Deon Meyer’s seventh novel, Trackers, is such a book: a gripping thriller told with just the right amount of detail to authenticate and enrich the reading experience. Readers need not know what “dassies,” or “bakkies,” or any of dozens of other South African terms mean to appreciate that they’re in the hands of a master. Beautifully translated from the original Afrikaans by K. L. Seeger, Trackers is a sweeping saga as lush and unforgiving as the African veldt. Told in four parts, Book One opens with Milla Strahan, the emotionally abused wife of a philandering husband and mother of a cruel and self-centered teenage son, who has at last worked up the courage to leave the high walls and alarm systems of her plush northern suburbs Cape Town home. With little more than the dream of finding work as a journalist and of perhaps one day writing a novel, she strikes out on her own. But the job market favors the young. Milla settles for a lowly “journalism” job at a secretive government agency writing intelligence reports. Soon a whole new world opens up for her that includes organized crime, diamond smuggling, Muslim extremism, political intrigue, and terrorism—a world in which, as it turns out, Milla’s skills are far more suitable than she could have imagined. A counterpoint to Milla’s tentative foray into South Africa’s seamier underside is Lemmer, the charming if brutal freelance bodyguard introduced in author Meyer’s critically acclaimed Blood Safari. 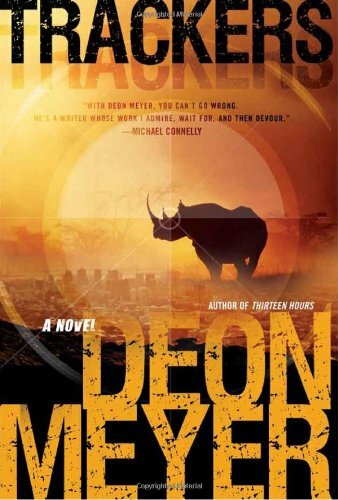 Against his better judgment, Lemmer agrees to help a wealthy farmer smuggle a pair of rare black rhinos out of Zimbabwe. Before he knows it, Lemmer is on a dark and dusty road in Limpopo with a Smith & Wesson Model 500 against his head. His assailants kick and beat him, then steal his Glock—the same gun they used to murder one of their own—a gun that has his fingerprints all over it. Lemmer wants it back. And he wants revenge. Connecting Milla and Lemmer is Mat Joubert, a former SAPS police officer working his first case as a private investigator, a cache of stolen diamonds, brutal internecine gang warfare, and a cargo about to be smuggled into the country that’s so outrageous, the rumors about it can’t be true. Or can they? Karen Dionne is the internationally published author of the environmental thrillers Freezing Point and Boiling Point. She is cofounder of the online writers' organization, Backspace, and serves on the International Thriller Writers board of directors as Vice President, Technology.